While Streisand sings, the world stops. She is only 23. yet her name is spoken around the home as often as Jello. The money she makes would put a dent in the national debt. Her first TV special was a milestone. Her second should have even greater impact. She turns records into gold, theaters and concert halls into mob scenes and on TV alone, during the next 10 years, she will make $5-million plus. To hear her sing is like getting the message from special delivery. Her success, like most successes, brings pressures with it. For one thing, she hates being interviewed, distrusts all photographers and is as nervous about publicity as she is about her own performances. Reporters covering her second CBS-TV special, "Color Me Barbra." to be shown this Wednesday night, 9-10 P.M., even had running bets on just how late she would be for each interview. The answer was almost always: very. The damp, gray hotel room in Philadelphia is charged with tension. The reporter's date was for one o'clock; it is nearly three. Somewhere, in a suite high above, Barbra is pasting sequins on her eyes. She wanted Pablo of Elizabeth Arden, but he takes too long. Barbra hates to sit still that long. In the corner, a kindly CBS press agent pours Scotch from a bottle sent up by room service. People come and go, telephones ring mysteriously. Everyone smiles nervously. The taping is scheduled to begin at the Philadelphia Museum of Art in two hours. "Barbra is very unpredictable; to tape songs for the show, we rented a studio from 7 to 10 last night; I got home at four A.M.," says the press agent wearily. People drop by to give opinions. "She sings more subtly now," says her personal publicity girl, a pretty blonde with pierced ears. "She used to sing her guts out; at the end of 'Happy Days' she sounded like she was screaming. She'd never do that now. When she was in 'Wholesale' she used to beg the press agent to get her interviews so she could get a free meal. Reporters used to stare in horror at the table piling up with hors d'oeuvres, three appetizers, two soups, celery tonic, tomato juice, a main course, and four selections from the dessert tray. Now everything's going so smoothly she only worries about details, refinements. She knew her work so well in 'Funny Girl' she never worried about the singing, but about the dust on the plastic flowers or why the blue light failed on Cue 82. Her closing night she was still giving notes to the orchestra on what they were doing wrong." Word comes, from on high, that the star is ready for her audience. Three-and-a-half hours late, she plods into the room, falls into a chair with her legs spread out, tears open a basket of fruit, bites into a green banana and says to the reporters, "Okay, you've got 20 minutes." What's the new show like? "Like the old one. They're like book ends. The first one was great, ya know? So this one's gonna be close as it can be. What do I know from TV? I hire the best people in the business, then I let them do everything for me. I don't take chances. I'm paying the bill, it's my problem, right? I coulda got some big name stars to clown around just like everybody else does on their specials, but who needs it? I got complete creative control here, so I do it my way, right?" How will the show differ from last year? "Instead of Bergdorfs, the first part's in a museum," she says, munching on a bunch of grapes. "I move around in front of the paintings and sometimes I turn into the paintings, get it? The costumes are mostly designed by me, borrowed, rented, or re-made from my old hock-shop wardrobes. The second part's in a circus, and I sing to all the animals. The last part's the concert. Just like last year's. Different songs, same feeling." Eight people have moved into the room. All of them check their watches and make her very nervous. Some of them answer her questions for her. Barbra does not like the image that comes with being a glamorous star, volunteers one. "She doesn't like parties; she's afraid people ask her because she's a celebrity, not because they like her." "Yeah, like this party for Princess Margaret, you know? Elliot, my husband, even wore a tuxedo. We were so miserable we cut out for a Ninth Avenue delicatessen, my favorite restaurant, where they still got great greasy french fries and the best rice pudding in town. No raisins, you know what I mean? "Listen, all my life I wanted to be famous. I knew from nothing about music. I never had a Victrola 'til I was 18. I used to buy clothes in thrift shops. Now I don't go there anymore because people bother me. Besides they've gone up. I always dreamed of a penthouse, right? So now I'm a big star I got one and it's not much fun. I used to dream about terraces, now I gotta spend $500 just to convert mine from summer to winter. Let me tell you, it's just as dirty with soot up there on the 22nd floor as it is down there on the bottom." At 5 P.M. the museum closes and the cameras are ready. An armada of armed guards line the doors with name tags for everyone official. Disgruntled reporters and unhappy photographers line up in a Renaissance hallway for clearance. "Barbra gets very upset if anyone who isn't official watches her, says a cameraman. Outside, the Philly branch other fan club peers through the beaded glass windows carrying a sign that reads. "Welcome Barb. Barbra even has a fan club in prison," offers the press agent. At 7:30 Barbra emerges in a floor-length, op-art gown of hand-sewn sequins in 20 colors and six-inch triangle earrings with bolts of lightning through them like Captain Marvel emblems. Mondrian eyes sharpened with mascara and boyish hairdo slicked back behind her ears, she is ready for the first number. A 25-man production crew, a trained nurse, her personal staff and a few favored members of the press watch as bongo drums blare from portable speakers and Barbra shimmies past walls filled with Cezanne watercolors and Matisse still-lifes shaking on their brackets. The number is repeated a dozen times before choreographer Joe Layton bounces through in white tennis shoes and white turtle-neck sweater crying, "It's awful. It needs work." By 9:30 the test pattern is adjusted and the color cameras are ready for the fourth tape of the first song. A cameraman crushes out a forbidden cigarette on a valuable piece of 100-year-old Rumanian oak while a guard isn't looking. "Let's go, Barb!" "I gotta get up?" cries the star. Hard looks from Joe Layton. Barbra gets up. "She's not dumb," says a CBS official. "She heads two corporations — one packages her specials, pays her everything, then the profit she makes is the difference between her expenses and what CBS pays her. This includes her salary. It's a one-woman show, so it would be very weird if she was not the boss." By 11:15 she comes out in a floor-length black satin maid's outfit with white over-apron, which she designed herself. Elliot Gould, her husband, arrives, wearing an official label so the guards will let him in. Barbra runs past 12 pillars and up 35 stone stairs singing "Yesterdays." Then she collapses in a corner eating hot pastrami, sour green tomatoes, kosher pickles and stuffed gefilte fish from paper containers. "My gums hurt," she cries. The crew throws color cables over the balcony of the museum's Great Hall, missing by inches a valuable Alexander Calder mobile and a priceless 17th-century Flemish tapestry. A museum official screams. Barbra's manager, Marty Erlichman, comes over. Marty is a friendly, bear-like fellow who discovered her at the Bon Soir fresh out of Erasmus High School, a smart, skinny, big-nosed girl who had a 93 average and a medal in Spanish. When he met Barbra he was a little-known talent agent working on Broadway. Now he heads his own company. "For nine months I tried to get her a job. Every record company in the business turned her down. 'Change the clothes, change the nose, stop singing the cockamamy songs.' Now it'll start all over when she hits Hollywood to make Funny Girl. They'll want to make her into Doris Day. But she sells the public Barbra, nothing else. She's never been bastardized or exploited. The main thing she's gotta learn is not to trust too much. The public is very fickle. Ten million people love you when you're an underdog on the way up, but nine and a half million of them hate you when you hit the top." At 2 A.M. a group of teenagers appeared at the museum with a kettle of hot chicken soup. "Just give it to her," they yell through the locked doors. "Could she just wave?" Barbra is busily chewing sour green apple gum (her current favorite) in a lavender and silver Marie Antoinette costume with lavender wig and purple ostrich plumes. "Get rid of them. They follow me everywhere. Sometimes they get my autograph three or four times in one night. Whatta ya think they do with all those autographs?" The action continues through the next day, with no sleep. Barbra works very hard. Others stop to rest, but her extraordinary energy carries her through. Barbra playing a guillotine scene in the French Revolution. Barbra doing "something based on Nefertiti." Electricians and reporters curl up on tabletops and behind potted palms, catnapping "If the star gives up, everybody gives up. I gotta keep smiling," says Barbra. Gradually, the bits and pieces, the long shots and closeups, the takes and retakes that make up a smooth-looking show are assembled. Back in New York, part two was achieved through sheer tenacity. Barbra danced out onto a three-ring circus set. A baby elephant named Champagne roared so loudly that a baby llama nearby did a somersault. Barbra sang "Funny Face" in an orange ringmaster's costume. The horse reared, the penguins got sick under the hot lights and had to be carted off to a refrigerated area behind the set. The leopard refused to pose. Barbra had to worry not about being trampled to death but when to come in on cue. The show was behind schedule and the overtime was costing the star money. Four electricians chased a pig across the set and damaged part of the backdrop. The only light moment came when Barbra sang to an anteater named Izzy. "He must be Jewish," she said, as they touched noses. More than 30 hours were spent on the circus segment, which runs only a few minutes on screen. Barbra's temper exploded. "Too many people not connected with the show." "Too many people staring at me " The press was removed to the control room. By week's end there was nothing left to tape but the concert portion of the show. Barbra came out in a pale creamy gown with pearl drop earrings and pale lipstick, standing on a white spiral staircase under blue-turning-lavender lights, switching on the charm for an audience of teased hair girls and screaming teen-age fans—clowning, joking, kibitzing with her little dog Sadie ("a hooked rug that barks"). The magic shone through. Barbra became the public figure-gamine, appealing. By midnight some 200 hours of hard work were over. The grips packed up the set was struck. "Great show! She'll make millions on the re-runs," said a control-room engineer. "Give me Julie Andrews any day," said an electrician, wiping his forehead. 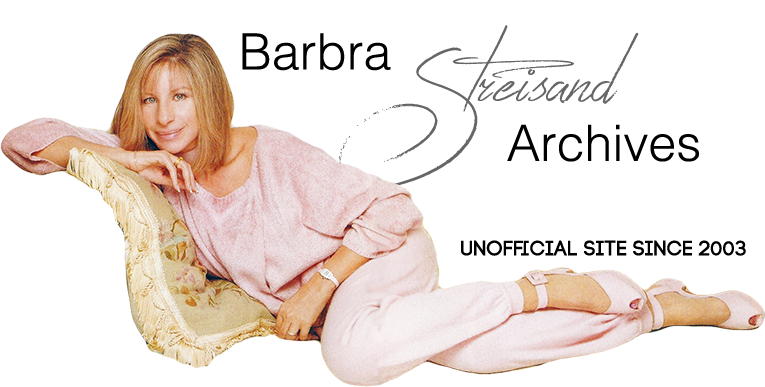 In her dressing room, the star of the show was told she could finally go home to bed and for the first time that week, Barbra Streisand was on time.